Milk Replacer for Puppies. Food Supplement for Dogs. 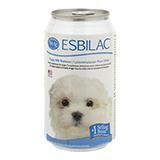 Liquid Esbilac is used full-strength. Refrigerate after opening, and use within 72 hours. All puppies should receive their mother's milk for at least 2 days if possible. The colostrum in mother's milk gives extra nutrition and temporary immunity against some diseases. When dealing with orphaned puppies consult your veterinarian for advice. Ingredients: Water, Condensed Skim Milk, Soybean Oil, Sodium Caseinate, Cream, Calcium Caseinate, Egg Yolks, Dl-Methionine, L-Arginine, Calcium Carbonate, Choline Chloride, Lecithin, Magnesium Sulfate, Potassium Chloride, Monopotassium Phosphate, Salt, Tricalcium Phosphate, Carrageenan, Dipotassium Phosphate, Dicalcium Phosphate, Ascorbic Acid, Ferrous Sulfate, Potassium Hydroxide, Zinc Sulfate, Vitamin A Supplement, Vitamin E Supplement, Niacin Supplement, Calcium Pantothenate, Copper Sulfate, Maltodextrins, Thiamine Hydrochloride, Pyridoxine Hydrochloride, Riboflavin, Manganese Sulfate, Vitamin D3 Supplement, Potassium Citrate, Potassium Iodide, Folic Acid, Vitamin B12 Supplement, Biotin.